How do you do the woodchopper? There’s no excuse to miss a workout, even if you can’t get to a gym. The woodchopper can be a great workout even if you just want to switch up the routine. If there is a tree in your yard that you want to get rid of or replace, save some money by doing it yourself. 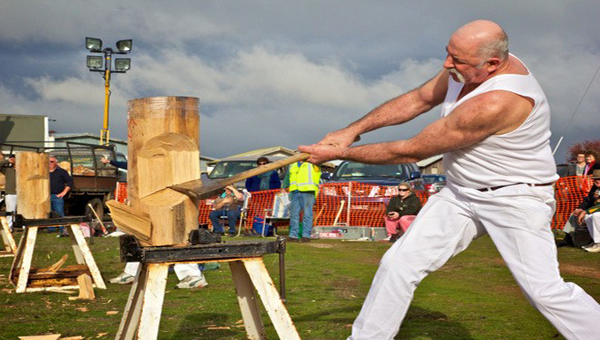 Chopping at a tree or splitting wood can burn around 500 calories per hour. The exercise is very functional and explosive. Your core should generate the majority of the force for this exercise, but your legs and arms also get worked. Safety is a huge priority. You need eye protection because chips go flying everywhere. Gloves will protect your hands from blisters. Place your feet wide so you have a strong base. Also, start one hand high on the axe and slide it down gradually as you swing so you have complete control over the head of the axe. Use your core to generate the power in your swing. You should not be using all arm strength. This is a full body movement that requires power from your legs and core mostly. Keep in mind that before chopping any old tree down, most cities and counties have different rules about tree removal. Make sure you have permission from the proper people before swinging away. Lastly, if you take a tree off the earth, try to make sure it’s dead first. Plant a couple to replace it. It’s good for the earth and your body. After all, vigorous gardening is a whole separate workout in itself.